This impromptu lesson in Shakespeare translation does more than simply point out the inconsistencies in translating works of art, though. 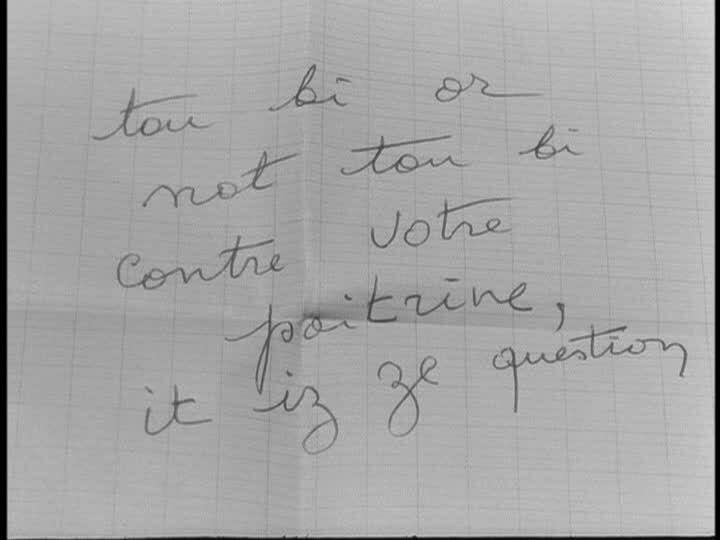 Godard shows his hand in a quick exchange: Arthur writes Odile a love note written in a kind of English/French pidgin, using the confusion that arises in translation for his own ends, namely making a pass at her. 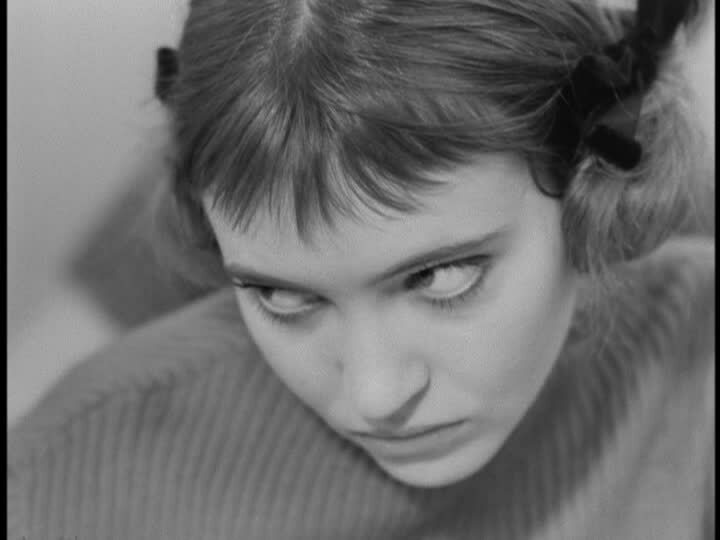 Odile (or Godard?) vindicates Arthur’s attempt by giving us the sound of a heartbeat overpowering the rest of the soundtrack, indicating that playing with translation, rather than dogged self seriousness, is the way to a girl’s heart. 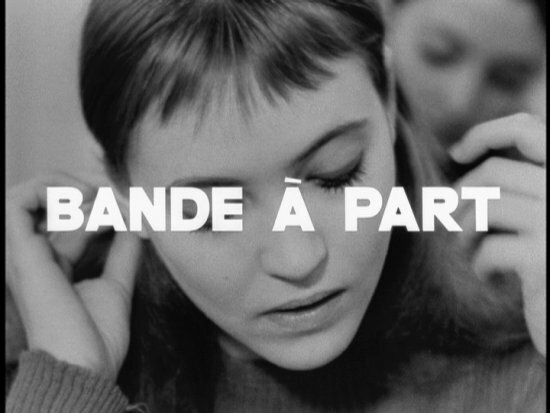 Godard, similarly, uses Band of Outsiders to make a playful statement about cinema. 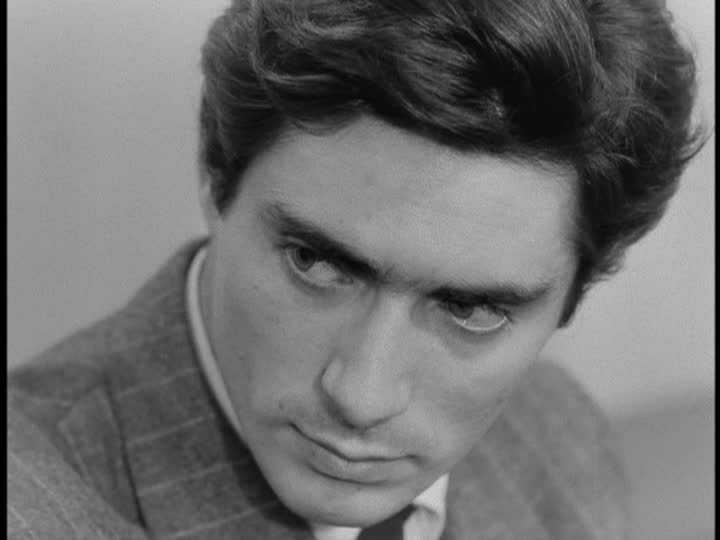 Just as some new translations of ancient texts transpose the language into contemporary vernacular, Godard annotates his film with personal references and stylistic flourishes. 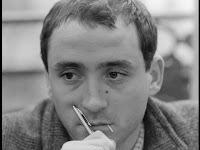 He seems uninterested in how well his film adheres to the original text, but instead relishes the freedom that comes with the ability to re-write the story in a new medium. For Godard, as he immediately indicates with his opening credit: “Jean-Luc Cinema Godard”, filmmaking is about fusing the cinema to one’s own self. 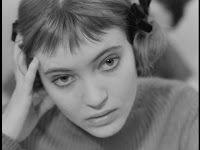 Godard takes as one of his main subjects Odile / Anna Karina, and uses the characters and the references they make in Band of Outsiders to weave a personal essay in many voices. 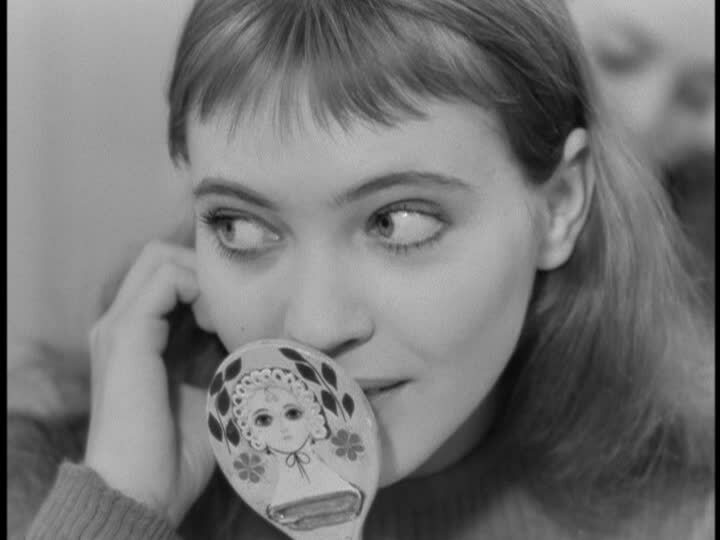 Karina, Godard’s wife at the time, starred in six other Godard films in as many years. 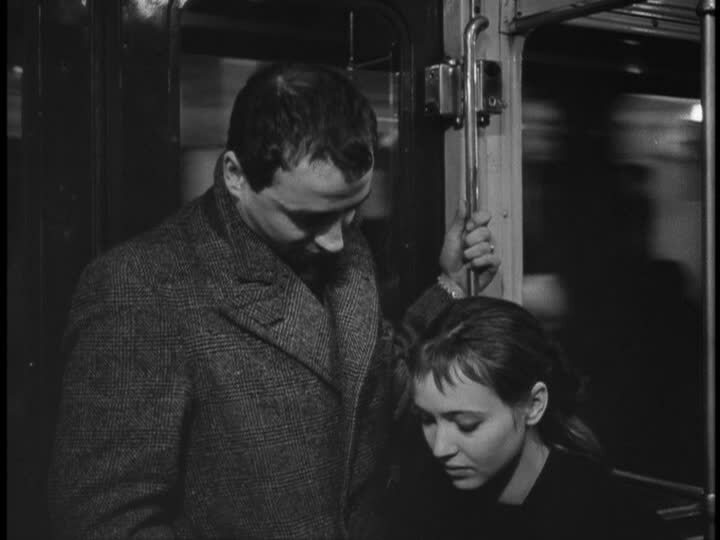 Here she represents both an object of affection for and source of conflict between the two male leads, but her presence is equally polarizing for the audience and doubtless for Godard as well. On more than one occasion, she either threatens to or succeeds in disrupting the flow of the film, demanding that it stop to contemplate her rather than the plot. Odile shares many traits with Godard and his cinema in general, including a connection with other movies: something almost implicit in her character. The spur of the moment “Madison” dance in a café, perhaps the most famous scene in Band of Outsiders, doesn’t have anything to do with the plot. Nor does it, cinematically speaking, come out of nowhere. When the three friends enter the café, Odile leaves for a moment to go to the bathroom. 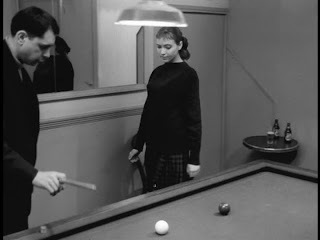 After descending the staircase into the basement, she passes by some men playing pool while a popular song from The Umbrellas of Cherbourg plays in the background. Perhaps moved by the auditory reminder of the cinema, she stops and lingers by the pool table on her way to and from the bathroom, as if experiencing déjà vu prompted the tableau of a pool room accompanied by a pop song. One gets the feeling that she might want to burst into a dance, though even she isn’t sure why. 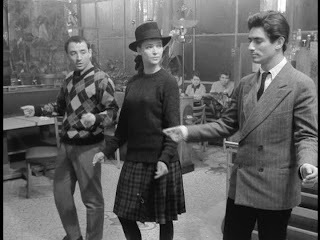 It reminds us of Karina’s other famous dance scene, that of the pool room in Vivre sa Vie, just as she seems to remember it from another life. This is one of many pieces of evidence that point to Odile as a kind of meta-filmic character, as well as a tool Godard can use for commentary. Soon after this, Odile and the others observe “a minute of silence” when they have nothing to say to one another. Though Franz suggests this it is Odile who implements it, counting down from three, commanding the film’s soundtrack to observe the moment with them (surprisingly, it complies). After this moment of silence, they answer the call from cinematic past and launch into the “Madison” in the middle of the room, spurred by cinematic memory or that peculiar instinct of the liveliest of movie characters. Odile continues to function as a symbol of cinematic life itself throughout the film: Music plays as she runs through the forest, but cuts out whenever there is a parallel edit to the boys waiting for her. She is able to direct her concerns about the plan to rob her aunt directly to the audience. When she blurts out to Arthur that she loves him, a neon sign that reads “Nouvelle Vague” appears as if on command to represent the youthful, tempestuous emotions associated with Godard and his colleagues. In one extraordinary sequence, when she mentions to Arthur that she wants to be married, the train they are riding on is revealed to be still, even though it was in motion just moments before. 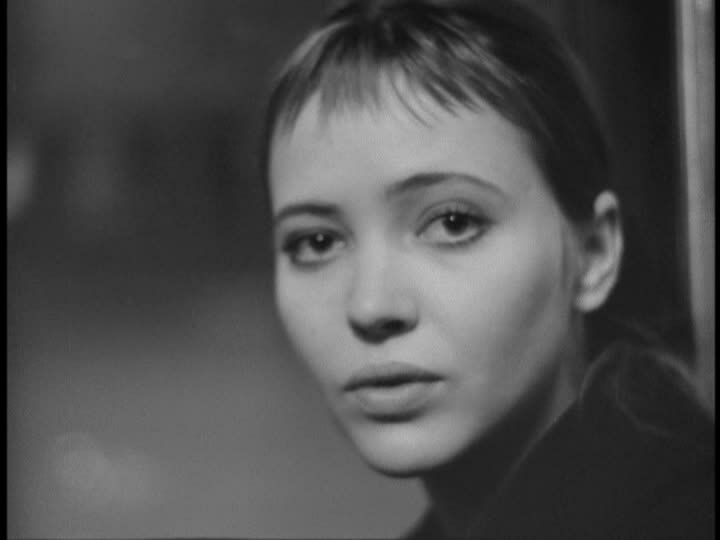 Odile bends and breaks the rules of film at every turn, always in such a way that simultaneously reaffirms both her vitality and Godard’s faith in the medium itself. In translating her to the screen, Godard allows her to breathe and evolve beyond a mere page-bound character and into a living cinematic one. Godard’s final technique deployed to voice his theory of cinema quietly works throughout the whole film. 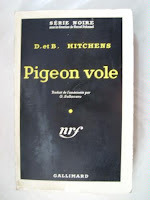 While Arthur, Franz, and Odile shuffle their shoes over the restaurant floor, we hear a voice on the soundtrack analyze their thoughts.2 The literary device of an omniscient narrator gains an additional layer of power when employed in the service of film – we can watch the characters at the same time as we hear their innermost thoughts. 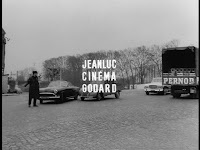 However, Godard also wishes to interrogate its usefulness, or at least its necessity, when paired with a moving image. Using this technique earlier, in a slightly different way, as they are exiting the English class, the narrator intones, “We might digress now, and describe how Odile, Franz, and Arthur each felt. But that’s pretty clear. 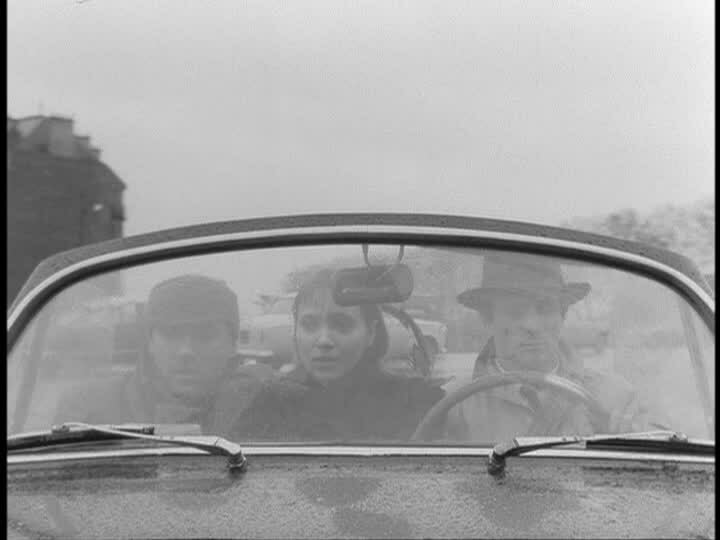 So we’ll let the images speak for themselves…” However, the next cut is to the three of them in a car with their faces partially obscured by the windshield, making it difficult to delineate their facial expression or how they might be feeling. Clearly, images cannot always tell us everything. Even so, Godard has stealthily provided us with one of the film’s strongest examples in support of the narrator’s statement prior to said scene: yet another short sequence back in the classroom. After Odile receives Arthur’s note saying that she looks old fashioned with her hair up, there is a series of three alternating close-ups of each character (some of the few true close-ups in the film). They don’t say anything, the teacher continues her lecture in the background, and they merely look back and forth at each other, but through simple facial expression their excitement, doubt, and jealousy become impeccably clear. Godard’s apparent lack of interest in the heist aspect of the story underlines his overall point, that the act of translation and how it allows you to mold the story to yourself are the most important things. In every one of his films he seems determined to foil expectations, allowing for moments of beauty, clarity, or thought to slip in while our defenses are down. 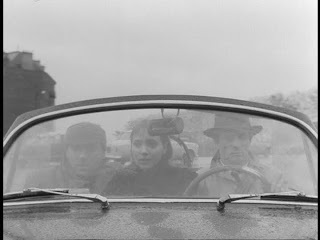 The surrealists (who play an integral part in the film’s elaborate referential scheme) used to go to movies already in progress, staying only until they were able to understand the plot, and then leaving.3 They wanted to find something else in cinema, going from one film-in-progress to another, stitching together their own films in their heads from the disparate moments glimpsed in separate theaters. In a way, Godard’s rendition of cinema is akin to this, suturing images and words that have special meaning for him into the body of his film, creating a Frankenstein-like creation that has accumulated extra potency through his personal translation of a standard story into a film. 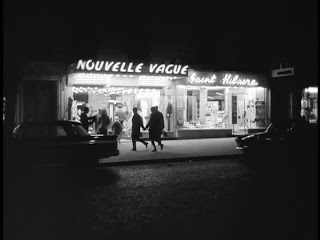 1 – The Serie noire was a celebrated imprint of the French publisher Gallimard, which specialized in French translations of English language hard-boiled crime fiction including Raymond Chandler, Chester Himes, and Jim Thompson. 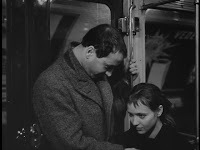 Truffaut also culled Shoot the Piano Player from their publication of David Goodis’ novel Down There. 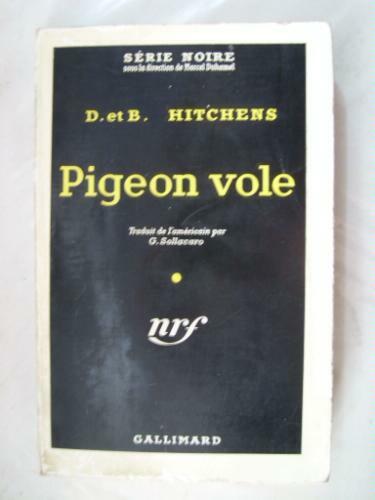 The French title of Fools’ Gold holds some significance here as well: Pigeon Vole ­– a children’s game similar to “Simon Says” where the aim is for one child to confuse the others by means of word-play. 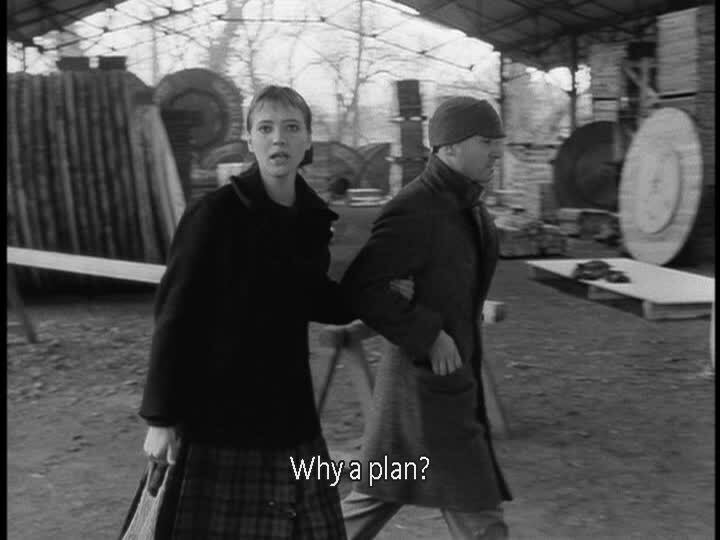 This dovetails nicely with Godard’s playful treatment of a hard-boiled plot infused with references and puzzles. 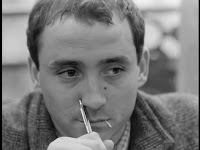 2 – This is Godard himself, acting as the film’s narrator. 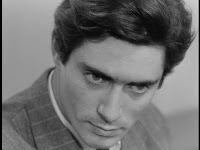 Knowing that he is the one speaking, his comments can be seen to take on the form of a dialogue with himself – he is commenting on the film he has made, commenting on the characters who are already parts of himself, or commenting on the usefulness of voice-over narration itself (which, as evidenced more than once in the film, he seems to have doubts about). 3 – Godard stated that he wanted the film to feel like the pre-war novels of Georges Simenon & Raymond Queneau. Queneau’s novel Odile, from which he takes his heroine’s name, is about the surrealist scene in pre-war France. 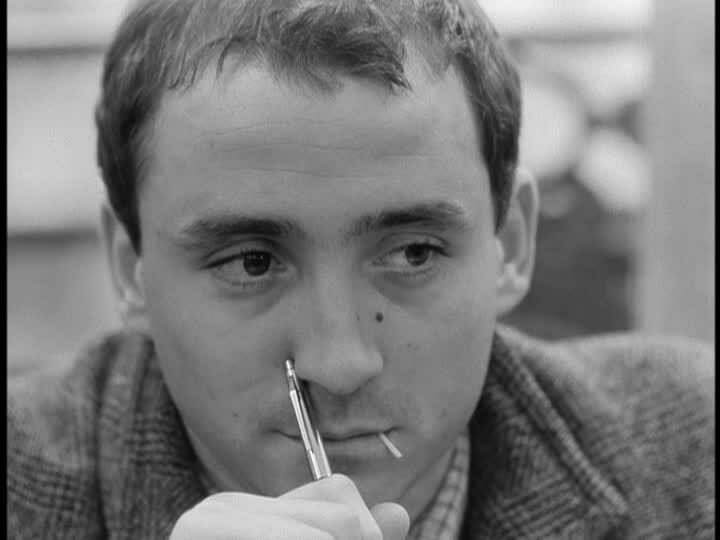 In typical fashion, Godard has inserted a joke to confound even the surrealists. About ten minutes in, the narrator says, “For those just arriving…” and proceeds to narrate, in brief elliptical sentences, the film’s entire back story, forcing any theater-hopping surrealist to up and leave before he scarely had the chance to get comfortable in his seat.